This is the first of a series of articles based on our Fearnan Oral History Project. Over the next few months, Pat Menzies and Fiona Ballantyne will interview a number of local residents in order to capture their recollections and memories of Fearnan, and to record them for our archive. 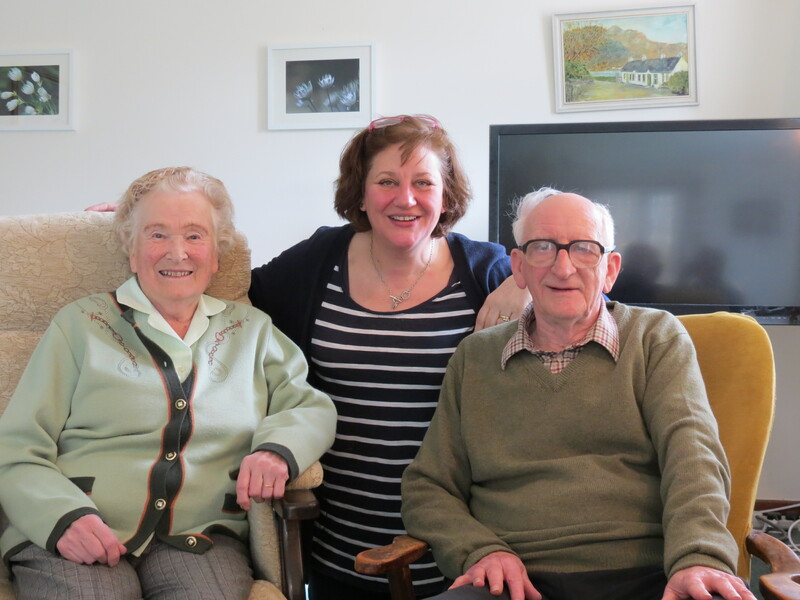 Our first interviewees, and willing guinea pigs, are Joyce and Alistair Halden of Burnside, seen here with Pat. During the conversation, both Pat and Fiona were struck by how often Joyce and Alistair referred to the friendliness of people in the village, and how easy they had found it to settle here. They retired to Fearnan after 18 years teaching at Croftinloan School in Pitlochry. Their original plan was to retire to their house overlooking the sea in St Monans and to become Fifers. However, as retirement approached, Alistair realised that his heart was in the Highlands and he really wanted to stay in Perthshire. Joyce wasn’t so sure about this change of plan, but a house-hunting trip to Fearnan convinced her to swap her sea view for a loch view (“The views were captivating. I fell in love with it.”). This picture was taken when Joyce and Alistair retired. 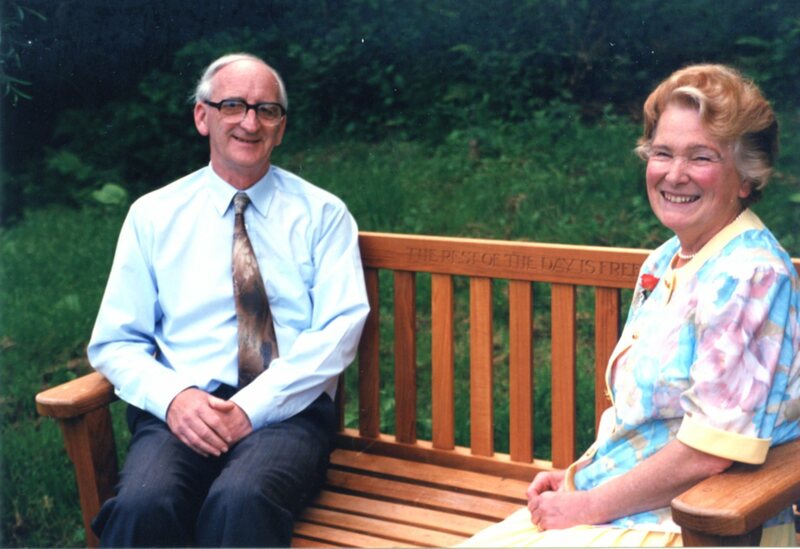 The pupils from the school gave them the wooden garden seat inscribed with the words ‘The Rest Of The Day Is Free’, taken from a poem about retirement that Alistair had written. The pupils and staff of the school thought the sentiments expressed were a fitting dedication to the couple for all their hard work over the years. Moving to Fearnan in 1994, they set about redesigning the acre of garden surrounding their new house. Joyce was determined that nothing would distract her from concentrating on the garden for the first few years, but a night out to hear the Fearnan Ladies Choir in their Christmas Concert at the village hall somewhat changed that plan. Whilst sitting in the audience waiting for the concert to begin, Joyce was approached and asked if she would stand in and play accompaniment to the choir for the first part of the concert, as the usual accompanist had been delayed. Whilst most of us would find this a rather extreme form of audience participation (unrehearsed after all! ), the former music teacher not only rose to the occasion but did it so well that she was later invited to lead the choir. So, for 14 years from 1997 to 2011, the choir gathered every Monday morning in Joyce’s house to rehearse. Regular concerts were held not just in the village hall, but in venues across Perthshire. Another Fearnan resident, Bob Woolley, would join them at their various engagements and entertain the audience by playing saxophone, clarinet and flute. 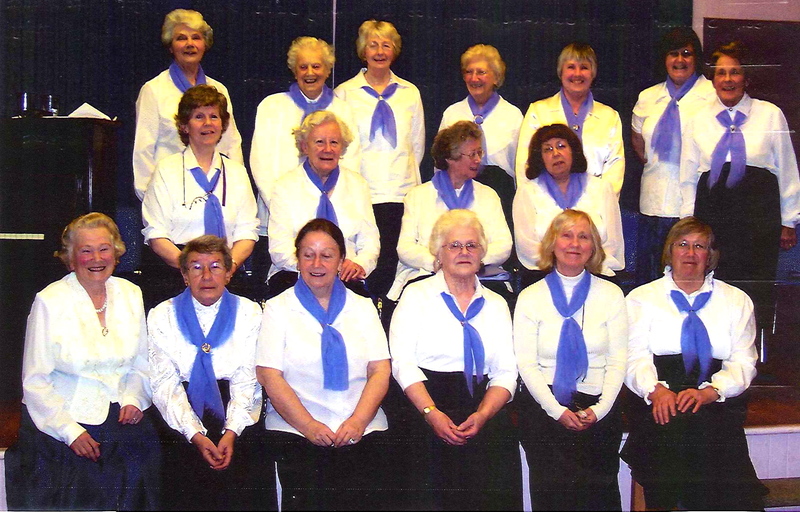 Back Row: Alison Skinner, Jen McGartland, Jean Woolley, Molly Baird, Georgie McGregor, Anne Brennan, Janet Harding. Middle Row: Lorna Cassells, Maisie Steven, Mary Masterson, Lynn Ferguson. Front Row: Joyce Halden, Jessie Coghill, Maureen McDonnell, Mairi Taylor, Rosie Hooper, Thea Fagerson. Other Choir Members not in the picture: Jenny Kininmonth, Kate Mackay, Kate Conway, Margaret Ellis, Margaret Pree, Marijke Goodwin, May Scott, Gina Angus, and Sheila Watford. It has to be said that Joyce’s garden can’t have suffered too much from the distraction of the choir, as it was featured on the BBC’s Beechgrove Garden programme in 2001. Click here to read the Beechgrove Garden Factsheet from the programme which includes a description of the Halden’s garden on page 11 – “Through the Garden Gate”. Joyce and Alistair refer frequently to the warmth and friendliness of people in the village. They remember the village shop, and what a treat it was to have a shop and Post Office where everyone was so chatty when they called by for their messages. They particularly remember a special send-off for the local postie who was going to go to live in Spain. Everybody gathered at the Post Office to say goodbye, and Liz Menzies brought a donkey along – adding a Spanish touch to the proceedings. Joyce and Alistair also recall how many events and societies there were, and how there seemed to be something on at the village hall almost every night of the week. The extremes of the weather, not surprisingly, feature in their memories – paddling through floods in wellingtons to get food at the shop before the breakwater wall was built; arriving home from a winter break in the warm sunshine of Gran Canaria to find their gates (very) firmly frozen shut. Neighbour Garth Menzies came to the rescue and helped them to get in. However, the next morning they had the opposite problem – they were now frozen in and couldn’t get out! More than anything, they talk about the kindness and helpfulness of friends and neighbours, particularly now that they are getting on a bit. The church at Fortingall has been a big part of their lives here, helping them to meet people and find friends when they first moved here, and keeping them connected thereafter. Indeed, over the years they have discovered many shared connections with other villagers, be it to do with music, horticulture, places, professional connections, mutual friends or a host of other subjects. They certainly don’t have any regrets about that change of plan and the decision to swap St Monans for Fearnan. On the day we visited, Joyce had been busy planting and pricking out seedlings for the new season in the garden and they were both very much looking forward to a forthcoming visit by one of their sons, his wife and their grandchild from Brisbane, Australia. I enjoyed your interview with Alistair and Joyce Halden. Just thought you would like to know that Jenny Kininmonth is my mother and this is how her surname is spelt.. She is mentioned to do with the choir that began in the 50s.